I love cookies and I love banana bread. So, with my most recent batch of overly ripe bananas, I just knew I had to merge the two. Have you noticed I seem to have a lot of overripe bananas? I might just do that on purpose! 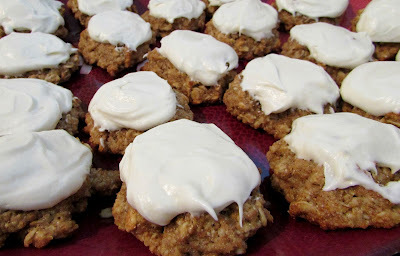 These cookies turned out soft and moist like banana bread, but in a easy to grab and go cookie form. Plus they are filled with fruit, whole wheat flour and oatmeal. So they are practically a super food. Of course a healthy dose of maple cream cheese frosting never hurt a thing! I took most of these to a hog roast, but kept a small plate of them at home. To my surprise Matt ate more than half of the ones we kept. He is never the one eating more of his fair share of the sweets around here. So I will take that as a compliment even if it meant fewer cookies for me! Mix together bananas and butter until smooth. Cream in sugar. Add egg and mix until fully incorporated. Stir together baking soda, salt, nutmeg, cinnamon, flour and oatmeal. Mix into butter mixture. Drop onto baking sheets in large mounds (1 1/2 - 2 tablespoons each). Bake for 8-10 minutes. Cook for 5 minutes before removing from pan to a wire rack to cool completely. Spread maple cream cheese frosting over them and enjoy! Follow Cooking With Carlee's board C is for Cookie and that's good enough for me! on Pinterest. I love that you used wheat flour and oats in this recipe. Healthy! And they sound amazing with that frosting! It makes me feel better about eating them! The frosting is amazing. Hi Carlee, wow you did it again! What a nice cookie recipe! Now I know what to do with ripe bananas! Between and the cookie, cake and oatmeal options I always have such a hard time deciding what to make! These are a good option for sure! You do the best baking! Thank you! I definitely have a sweet tooth. If only we lived closer you could smoke some delicious entrees and I could provide the sweets! 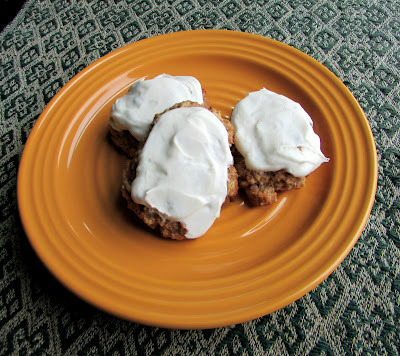 I just left a comment on your icing recipe - but I am so happy that I have ripe bananas this morning! These do look wonderful! I have some now too! I am thinking some sort of baked oatmeal with this bunch. Jax loves to help me make oatmeal! I just baked my first banana bread the other day, and I was hooked! Love how this has got wholemeal flour and oats in it to make it healthier. Oh my goodness, we love banana bread! I'm sure it will become a staple for you too! Wow, what a great idea. They look a little like my favorite cookie, the thumbprint. Great job making such a healthy treat. Thanks for linking up with Tips & Tricks and I hope to see you next week. It is fun to have a treat that you don't have to feel too guilty over! I love any kind of cookie with oats and wholewheat! These sound amazing! Thank you for sharing this with us at #SaucySaturdays! Me too! I think the extra chew and nuttiness is perfect for cookies! Thanks so much for hosting! These look so good, I have 3 overripe bananas in my fridge right now, so I think I may give these a try soon! Thanks for sharing at What'd You Do This Weekend?! I hope you love them! Thanks for hosting!